What’s Ailing Marketplace Lending Stocks? How’s this for a fintech startup only recently gone public- Q3 revenues up 107% year over year compared to expenses only rising 81%. Q2 was 101% vs 77% and Q1 was 110% vs 89%. Along with those growing margins, the Q3 figures also marked the company achieving over $100 million in revenues and hitting profitability. Triple digit growth and profits ready to take off, not bad for a company still within a year of its IPO. 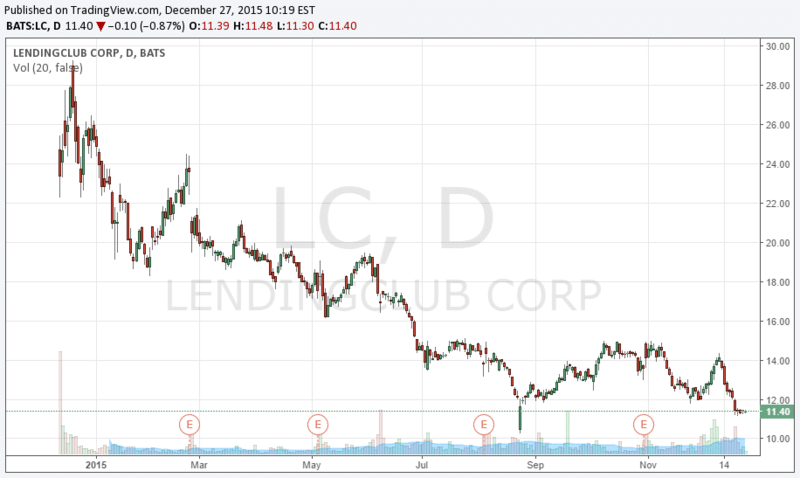 That company is Lending Club which went public in December 2014 and reported their Q3 results in November. But, as seen below, that operational exuberance isn’t being reflected in their shares which continue to sag. Lending Club isn’t the only marketplace lender to experience a poor reception in the public markets. OnDeck Capital which went public shortly after Lending Club has seen a similar underperformance, while recent IPO, China-based P2P lender Yirendai, is trading below its opening price of $10. What’s driving the lack of investor demand? Contrasting with the public markets, there have been warm receptions to Kabbage and SoFi which have garnered $1 billion plus valuation in the private markets. Those deals, along with many other smaller players, imply that investors aren’t averse to marketplace online lenders, but are specifically shunning the public ones. These deals may be hampering the public players. Lending Club and OnDeck’s stock descent reveal that their IPO valuations were frothy at the time. Both went public in 2014 which was a considerably better time for technology IPOs than 2015. In Lending Club’s case, the firm initially priced its shares at a $4 billion valuation, before increased demand led the firm to raise its offering price to $15 and a $5.4 billion valuation. Shares then shot up into the mid-20’s ultimately proving a valuation north of $8 billion. As such, these prices proved to be unsustainable given weakness in equities during 2015. As more of their competition sought private funding, institutional investors have gained more choice of where to put their dollars. In addition, among the worries affecting the entire online lending sector are competition and rising marketing costs. But, through partnerships and increased brand recognition, firms such as Lending Club are in fact able to keep expense growth in check as their revenues grow at a faster pace. Nonetheless, the competition does bring a danger that the sector will become commoditized as there is more crossover among new products from marketplace lenders than a year ago. Beyond marketplace lenders, traditional lenders such as banks are also competing in the space, digitalizing their loan processes to become online lenders. Compared to marketplace lenders, these firms provide loans from their own balance sheets instead of participating investors. Marketplace lenders established themselves as clear players in the alternative finance market in 2015. As such, 2016 should see more interest from investors. But 2016 appears to be the year that investors are waiting to see who the proven winners in this field are, with the staying power to emerge victorious from the competition. This question is set to become more interesting as the public markets could soon see SoFi, Zopa, CreditKarma (not a lender but an important funnel of leads to the sector) and Kabbage also indicating an interest in IPOs of their own.